I am always amazed at how you can meet new people, peel the layers back and find people you have in common that make this large world very small. 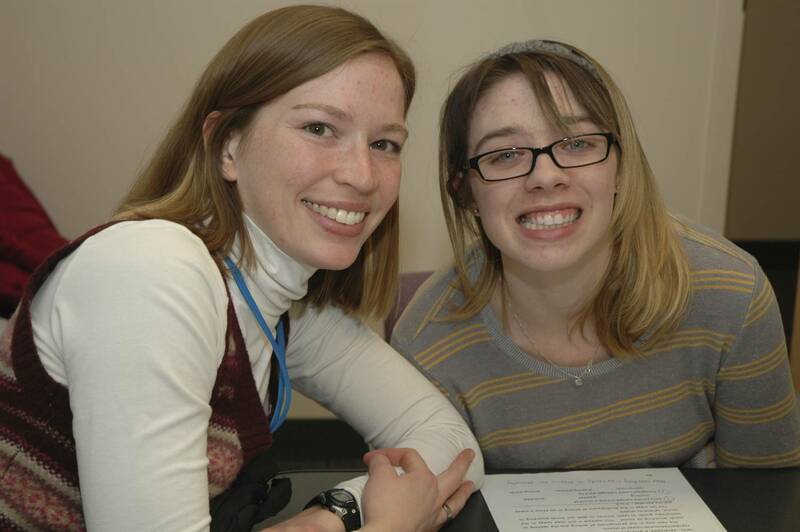 Sarah has been Carly’s speech therapist this semester. We actually met her in December as she began to follow Carly’s sessions in preparation for this year. Sarah has been wonderful and Carly has made progress with her hard work and help. Sarah is from Bosie ID and grew up with a very close friend who dances for the Momix Dance Company in NYC. 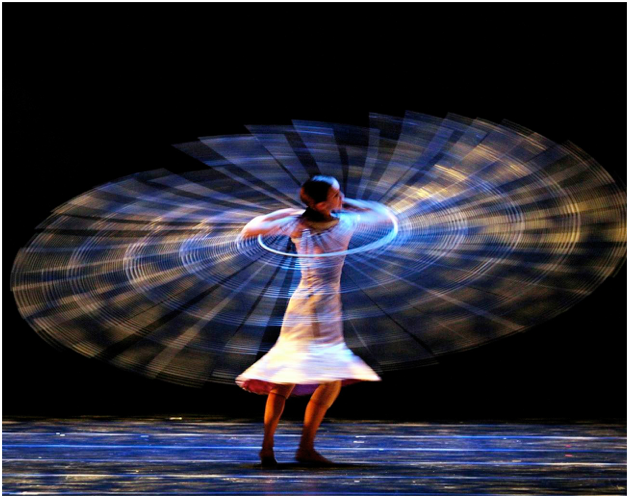 Momix recently performed in Salt Lake City. Sarah thought it would be a good outing for her to take Carly to coffee with her friend Tsarra from Momix. It was a great opportunity to engage Carly talking about her dance experience and her time living in NY. Once they started visiting it only took a few minutes to discover that three of Carly’s close dance friends, who originally came from her Performing Arts High School in FL, were close friends of Tsarra. Carly’s friends Zui and Jose both danced with Tsarra at the Boston Conservatory. Then in NY, Tsarra had danced with Sabrina who was with Carly both in high school and then at Alvin Ailey. If you take the time to interact with people, it truly is a small world. Tsarra like her close friend Sarah is a wonderful young lady. The time she took out of her busy schedule and limited time in Salt Lake to hang with Carly was a huge blessing. She then blessed us with tickets to the Momix performance. It was a wonderful evening. Watching Carly absorb the dance was amazing. If you ever get a chance to see Momix perform it is a wonderful evening of dance, illusion, and imagery. Go back one layer deeper and you will find Mary Foye (Photo, R-L Hadley, Mary, and Carly). Mary is the Clinic Supervisor and teaches Speech-Language Pathology at the University of Utah. Mary is the one who immediately took interest in Carly’s case as she read the medical history, she then greatly accelerated the U’s process and instead of waiting months, got Carly in therapy within 3 days. It was Mary who handpicked Hadley last semester to take on Carly when she already had met all of her graduation requirements. 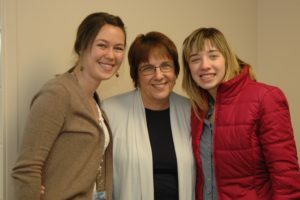 And it is Mary who picked Sarah to work with Carly this semester. Those two choices have made a big difference in Carly’s outcome. 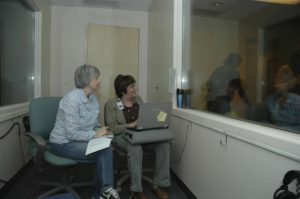 Mary is present at each of Carly’s therapy sessions sitting behind the one-way glass observing, taking detailed notes and working with Sarah between sessions. She has helped is in so many ways in getting involved with additional therapy, encouraging conversation and has helped is in getting an appointment next week with a Neurologist at the U which we are very excited about. Mary is the lady behind the scenes and another example of how God sends people to answer your prayers. It is ironic that Mary is now struggling with issues similar to Carly’s within her own family. Her brother Paul and his wife were on a trip to CA recently when Paul fell, hitting his head. He has been in the hospital and inpatient rehab for several weeks and suffers from head trauma, speech problems and diminished use of his right side. Please add Paul and his family to your prayer list. Paul is expecting an early release from the hospital and looking forward to returning home to Wisconsin. Pray that he God brings the right help for his continued recovery at home. We thank God daily for all of the family, friends and new people he is using to bless and assist the Mimstribe. Pray for Carly’s upcoming Dr appointment, for Katie’s continued recovery and finding a Job and for the many other details in our lives. Pray for Mary’s brother Paul, his safe return home and finding the right assistance for his recovery.